Tired of marking events and dates with a color pen on a wall calendar? If you have Microsoft Excel, you can now generate YOUR OWN wall, desk or email calendars, just by entering the intended YEAR and event details, like it's name, start and end date. Use different colors for each event or category. Select background and font colors for your calendar. Automatically insert event's legend. Use your own background image. Easy to use. if you know Excel, you know this! Really easy to use, just fill in the values in the Input Cells and press the "Run" button to create YOUR new Calendar. Academic / Fiscal Calendars: Select the Start Month for any 12 Month Calendar. 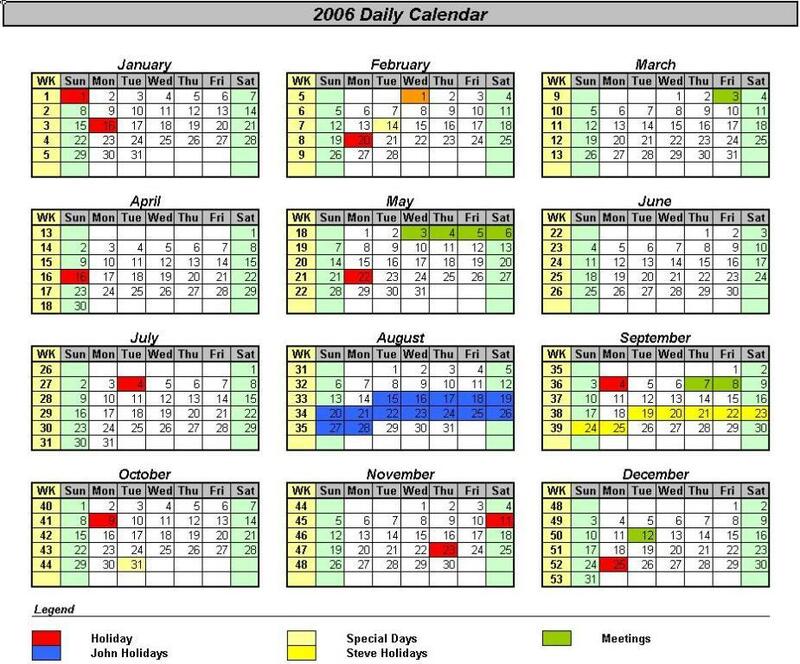 Create calendars spanning multiple years (Example: August 2007 to July 2008). 4-5-4 Fiscal Calendar format supported. Six Types of Calendars from the same events list! The Microsoft Excel macro will generate a new workbook with the resulting Calendar (PICs. 2 to 7). This new workbook HAS NO MACROS on it, just the resulting calendar. Change, save, print and email it as any other regular Microsoft Excel file. Really easy to use, just fill in the values in the Input Cells and press the "Run" button to create YOUR new Calendar. The Microsoft Excel macro will generate a new workbook with the resulting Calendars (PICs. 2 to 7). This new workbook HAS NO MACROS on it, just the resulting calendar. Change, save, print and email it as any other regular Microsoft Excel file. SIX types of Calendar: 3 Annual formats (Traditional, Table and Planning) and 3 Monthly Formats (Monthly, List and 4-5-4 Monthly), from the same event list! Import Tasks and Events from Outlook as calendar events! Great way to print Outlook Calendars in style. FULLY CUSTOMIZABLE calendar plans. 5 areas of customization. Less time adjusting calendars after generation. AUTOMATIC HOLIDAYS generator for ANY YEAR: Automatically add holidays to ANY year calendar (USA only). Optional Background Image - Add your picture of choice! Easier to Reuse: Clean all existing tasks with a single button click! Compatibility: Copy/paste task lists from previous versions! Automatically add holidays to the event list for ANY YEAR (USA holidays only for the current edition). Just select the Holiday List to Insert and press the "Insert Holidays" button. Event color and category can be defined on the Advanced Settings sheet. New Features - Just Released! New Calendar Format: Monthly 4-5-4 Fiscal Format. Total of SIX types of Calendar: 3 Annual formats (Traditional, Table and Planning) and 3 Monthly Formats (Monthly, Monthly 4-5-4 and List), from the same event list. HEADER & FOOTER Printing: Calendars can have custom Headers & Footers when printing. OPTIONAL inclusion of Week Numbers in Annual Formats. Get THIS and ALL other Excel CALENDARS in a SINGLE download! Click HERE! TWO Looks - with or without background image - even in print! On the Screen for email, shared drives, store on your own hard disk. On Paper for wall calendars and collective checking. Most Excel users are also Microsoft Outlook users and already have events like Meetings, Holidays and other tasks on Outlook So why write them again? Importing from Outlook is as easy as defining the desired source (Outlook Calendar or Task list) and Start and End Dates for the imported tasks. Press the Import from Outlook button and select the first row for the imported tasks (no overwriting of manually entered tasks). Relax and see your tasks being automatically added for you! You may import your main or sub Calendars or Task list and even SHARED CALENDARS just by entering its name! You can define Advanced settings for special cases on the macro CONFIG sheet. It can also be used to print Outlook Calendars or Task lists - Just import them, apply custom formats, create the calendar with the desired format and print it. Yes. There are three sheets on the Microsoft Excel Workbook (PIC. 15). The first one is the Input sheet, the second is the Help one. There is also an Online Help Page for this product (see bottom of page for all related links). Can the resulting Calendar be customized? Yes, before and after generation. Before generation, use the personalization options on the Traditional Calendars for Excel Input sheet to create the look YOU intend on the resulting calendar. After generation, the file can be manually changed as any other regular Microsoft Excel file. There are no special features to the Calendar file, it is a regular Excel file with painted cells. Can I save the resulting Calendar? Can I have several copies? It's a regular Microsoft Excel file. There are NO MACROS on the resulting plan, only on the generator file. It can be freely copied and manipulated. Tired of using color pens to mark events on the office or home calendar? Spending full days manually making calendars? Spending hundreds on specialized software you don't know how to use? 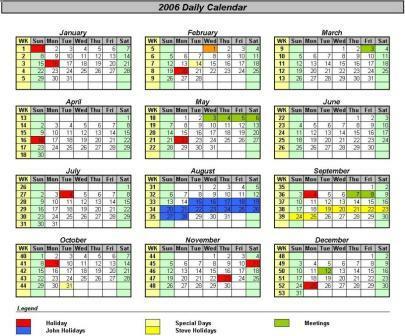 This easy to use Microsoft Excel macro will generate pretty traditional calendars in minutes. No need to learn new software skills. Get your Traditional Calendars for Excel now by using one of the BUY NOW buttons on this page. After payment at PayPal, you will get to a confirmation page with a link to download a ZIP file containing the Microsoft Excel file (XLCalendars40.xls). Click on this link and save the file to your own hard drive. You will need to unzip it (extract the Microsoft Excel files from the compressed ZIP file). Microsoft Windows XP will let you do it directly, presenting the file as folder. On older versions of Microsoft Windows, you will need an extra application like the popular WinZip. Once extracted from the ZIP file, just open them with Microsoft Excel every time you want to use it. DEMO versions of some of our other products may also included, for evaluation purposes. Download your FREE DEMO here! Don't wait any more! Creating beautiful full year daily calendars is easy. Get your copy here! Other Needs? Try the Universal Planning Calendar Excel Macro! Generate ADVANCED Project style planning calendar, just by entering the tasks and associated data like it's name and the starting and end date.